Home/Academia, Community, Corporations, Earth Charter, Ecological Civilization/What Will It Take for Business To Improve Lives? The proper purpose of any human institution is to improve the lives of the people who depend on it. If we support that proposition, then is there any place for a private-purpose corporation? The question becomes especially urgent as society and the human species face growing threats. 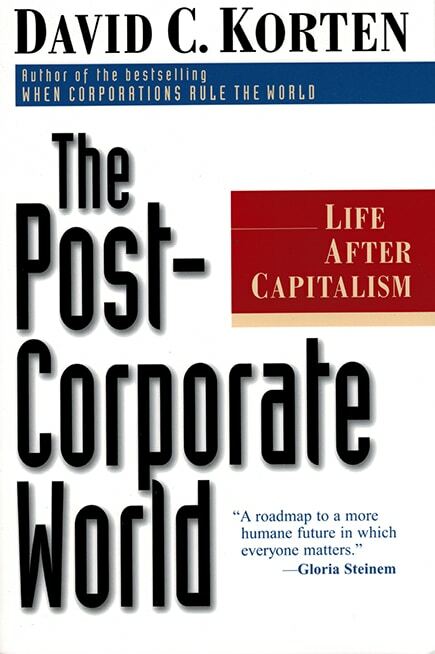 This paper posits that the private-purpose corporation, and the neoliberal ideology that affirms it are major drivers of the social and environmental destruction we daily witness. If that is the case, then what might be essential features of business institutions that would better serve humanity? What might be the role of a Theory of Community? And what might that mean for business education? This paper provides a broad framework for exploring those questions. 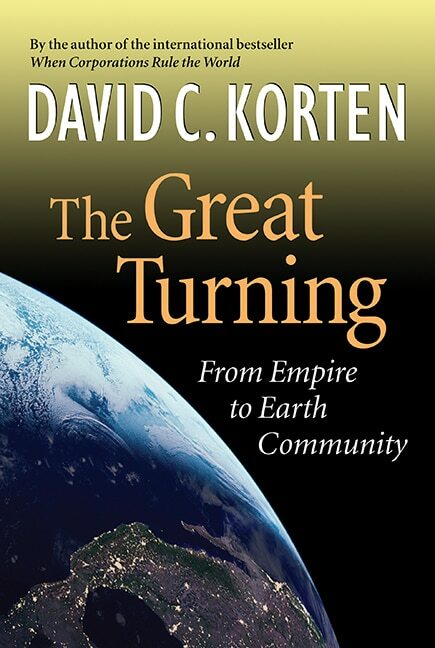 It describes the growing momentum for moving societies toward a future ecological civilization and notes the Earth Charter as a source of ethical principles. Finally, it identifies the outcomes the formal institutions of an ecological civilization must serve and concludes with five design principles that these institutions will need to honor to support lives of diversity, beauty, creativity, and meaning for all. Not so long ago, humanity was fragmented into isolated societies organized around widely varied human cultures and institutions. Some met the needs of all in a balanced relationship with nature. Others created cruel divisions between brutal rulers and enslaved masses. The differences along that spectrum demonstrate that we are a species of many possibilities. Over the past few decades, the revolution in air travel and communication technologies has brought humans together as a highly interconnected and interdependent species with significant knowledge of the range and consequences of our cultural and institutional choices. These developments now position us as a global species to create together—by conscious collective choice—a world of peace, shared resources, beauty, material security, and spiritual abundance for all. We have chosen, however, a different path. As humanity’s cultural and institutional fragmentation has given way to an interconnected global society, we have embraced money as our defining common value, competition for power and resources as our dominant mode of relating, and private-purpose, profit-seeking transnational corporations as our defining institutions. This set of choices puts humanity on a path to environmental and social collapse, possible self-extinction, and potential destruction of Earth’s capacity to support life. Five dominant global trends put us on track to become the first species on Earth to consciously choose its own extinction. Life Destructive Technologies. Our nuclear, carbon energy, genetic modification, and artificial intelligence technologies give us the capacity to destroy Earth’s ability to support life. We continue to increase the numbers and potential impacts of those technologies in disregard of the consequences. Extreme Inequality. We tolerate a growing wealth gap that reduces ever more people to lives of desperation as a few engage in profligate consumption far beyond any need. Oxfam estimates the financial wealth of six individuals now exceeds that of the poorest half of humanity. Consumption Beyond Earth’s Ability to Sustain. The Global Footprint Network calculates that we consume at a rate of 1.7 times what Earth’s regenerative capacity can sustain. Yet our defining economic priority remains to accelerate aggregate growth devoid of concern for who benefits. Corporate Influence on Government and Public Policy. We facilitate the growing economic and political power of profit-maximizing transnational corporations dedicated to the private purpose of growing the financial assets of the world’s already richest owners and managers. Loss of Institutional Legitimacy. We experience the rise in political demagoguery that follows when institutions lose legitimacy for lack of capacity to address society’s essential needs. These trends are predictable consequences of institutional choices based on a deeply flawed meta-narrative that ignores our essential nature as living beings, misrepresents the sources of our well-being and happiness, and denies the higher possibilities of our human nature. We have the right and the means to make different choices. To do so, however, we must be clear on what kind of society we seek and on the cultural and institutional changes this requires. China faces enormous obstacles to fulfilling this vision. But the fact that its leaders have laid out the challenge so clearly is a source of hope for humanity. Ecological civilization seems a fitting name for a future that fulfills humanity’s long denied dream. Ecological is broadly inclusive of all living beings. It puts the focus on the capacity of living organisms to self-organize in diverse, interlinked, and intrinsically symbiotic relationships to create the conditions essential to life. Civilization evokes the depth of the cultural and institutional transformation required to create a human future that is truly civil. Use of the term civilization needs a cautionary note. Imperial rulers have long used the term to legitimate expropriation of the lands and labor of peoples who were often more civil than themselves by dismissing them as “uncivilized.” A civilization that features civility among all parties on more than a very local scale is a human aspiration yet to be fulfilled. The institutional system that imperils humanity’s future is guided and legitimated by an elitist metanarrative—in this instance a political ideology—known as neoliberalism. That ideology ignores our nature as living beings, our need for love and meaning, and government’s necessary role in protecting the public interest and assuring assess to essential services. Neoliberalism’s twisted logic and values are burned into our consciousness through carefully chosen and constantly repeated memes— “economic growth,” “the free market,” “free trade,” “multinational corporations,” and “limited government.” Each is a code phrase that prioritizes private financial interests over public community interests. “Economic growth” prioritizes market transactions that grow GDP over self-care and gifting that do not. “The free market” signifies freedom for corporations to do whatever maximizes profit, free from public rules and oversight. “Free trade” means unrestricted corporate access to the world’s cheapest labor and resources to maximize profits by selling in the most affluent markets. 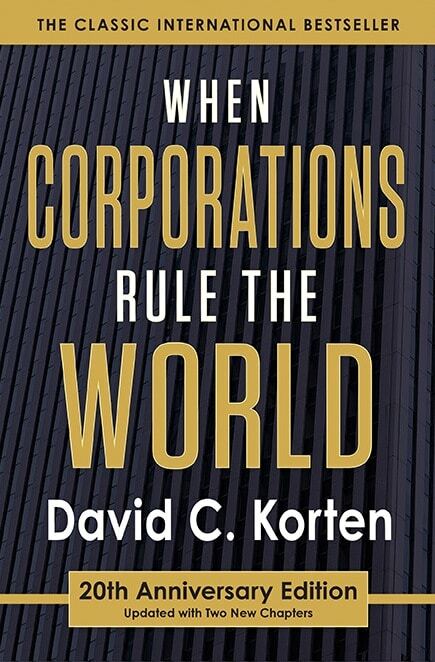 “Multinational corporations” (as contrasted to “transnational corporations) suggests that corporations that do business in several nations are rooted in each to obscure the reality that they bear no allegiance to the interests of any nation and its peoples. “Limited government” translates into low taxes and dependence on privatized services available only from profit-maximizing corporations to those who can afford what these corporations choose to charge. Business schools have embraced a specialized extension of the neoliberal narrative called the Theory of the Firm. This theory is presented as an objective, values-free explanation of how large corporations make decisions—not how they should make them. However, it embraces the neoliberal assumption that a firm’s only responsibility is to maximize financial returns to shareholders. It then explores how management incentives can be structured to ensure that profits will in fact be maximized and returns channeled to owners rather than managers. The Theory makes no reference to the interests of workers, communities, nations, or nature. Yet it is embraced by most teachers of business management as setting the standard by which corporations should make decisions. As a legal entity, a transnational corporation is the creation of the government that issues its charter. By long standing legal precedent, this charter facilitates the concentration of wealth and power while shielding owners from liability for harms caused. If a corporation sacrifices profit for a larger societal good, the law facilitates action by private financiers to buy them out and eliminate this “expropriation” of the shareholders’ entitlement. Government’s purpose is to serve the common good. Using its legal authority to serve the purely private interests of a tiny already highly privileged minority is an abuse of government power. The private-purpose corporation is an inherently illegitimate institution. The more transnational its reach and the greater its freedom from liability for its harms to others, the less legitimate it becomes. The Theory of the Firm can serve a critically important function by directing attention to the fact that the decision makers in society’s most powerful institutions accept no responsibility for the well-being of their workers, their customers, the national interests of any country, or nature. The Theory framed in this manner, reveals the need for immediate and decisive corrective action. Business educators concerned with improving lives need to educate an audience far wider than the conventional classroom in the existential threat that the private purpose corporation poses to society. Their expertise will also be required to craft a metanarrative and supporting memes framing the nature and purpose of the legally mandated institutions of an ecological civilization and a theory that frames how they are best structured and managed to fulfill that purpose. We could call such a theory the Theory of the Community. To find our way to humanity’s shared dream, we must begin not with what the firm—or even the society—should be doing, but with how complex life organizes. The scientific community is discovering that complex living organisms exist only in multi-species communities that self-organize to create and maintain the conditions essential to their existence. Rather than organize as centrally controlled hierarchies, they organize as self-organizing holarchies—interdependent wholes that work together as parts to create and maintain yet greater wholes. These processes serve as the foundational frame for the new living-systems meta-narrative. Our own bodies provide an intimately familiar example of how living organisms self-organize as living communities of interdependent organisms. Each human body is a self-organizing community of tens of trillions of ever-adapting, individual, decision-making living cells that create and maintain the body’s essential organs and beneficial microbe colonies. Together these interdependent parts manage a constant exchange of energy, nutrients, water, and information to create and maintain the body that serves as the crucible of our consciousness and the instrument of our agency. Each of the body’s cells constantly balances its own needs with those of the community (the body) on which its own existence depends, while also accommodating to the continual reproduction and death of individual cells. Together, they adapt to changes in temperature and inputs of food, air, and water, while also protecting the body from an endless variety of toxins and pathogens. When an organism no longer functions as a community to manage these processes its body begins to decay, and we declare it dead. Simultaneously, the body responds to instructions from our conscious mind, which also requires complex coordinated responses by individual cells to contract muscles as required to implement our preferences. The complexity of the processes involved defy current human understanding. We lack even the language to adequately describe them. Yet the processes all play out with so little effort on our part that we take them for granted and feel no need to attend to them. Living Earth is itself a complex holarchy of interconnected whole-part eco-communities. Each is comprised of countless species engaged in the continuous exchange of energy, nutrients, water, and information to regenerate soils, aquifers, streams, and rivers, sequester excess carbons, toxins, and other wastes, capture solar energy, purify air, and stabilize weather and temperatures amid constantly changing external temperatures and available supplies of water, nutrients, and energy. These self-organizing processes simultaneously control individual species populations to maintain the multi-species diversity essential to overall ecosystem health. Just as each cell of the body is part of a larger interdependent whole called “self,” we humans are part of a larger interdependent whole called Earth. We humans, however, have come to relate to Earth more as parasites than as contributing, interdependent members of the community on which we depend. We have embraced the private purpose corporation as a favored institutional instrument of our parasitism. Human institutions are human creations. Legitimate institutions are accountable to the communities that create them to improve the lives of those who depend on them. When an institution fails to fulfill this purpose, the community has the right to eliminate or transform it. When it threatens the community, the community has the obligation to do so. Humans do not live by narratives alone. We create institutions that align our collective behavior with our narratives. Contemplating the design of the formal institutions of an ecological civilization begins with articulating the outcomes we seek. At the most fundamental level, we seek a global society that meets the essential material needs of all people while restoring and enhancing the health and productivity of Earth’s natural systems. Fulfillment of this goal will require institutions, including the institutions of business and economy, that support four systems outcomes. Earth balance—the imperative to bring humanity’s total environmental burden into balance with the capacity of Earth’s generative systems. Immediate action is required to eliminate non-essential consumption—including the preparations for and the destructive consequences of war. Longer term action is required to create institutional and physical structures that make doing the right thing easy and enjoyable—for example designing urban environments to make essentials of daily living readily accessible by mass transit, biking, or walking in safe and pleasant neighborhoods. Equitable distribution—the imperative to achieve a just and equitable distribution of wealth and power. Immediate action is required to stop the further concentration of wealth while advancing its long-term redistribution, restoring the commons, and connecting the rights of ownership with their corresponding responsibilities. Life-serving technology—the imperative to make technology choices that strengthen rather than impair life’s regenerative capacity. Immediate action is required to eliminate the use of harmful technologies. Longer-term action is needed to further develop life-serving technologies. Democratic accountability—the imperative to assure that all institutional power is accountable to living communities of people and nature in service to the well-being of the whole. Immediate action is required to block further concentration of corporate power, while taking longer-term steps to secure the accountability of governments to the people, break up existing concentrations of corporate power, and establish rules that assure corporate accountability to the communities in which they do business. The design and management of ecological civilization’s supporting institutions is appropriately grounded in our rapidly expanding knowledge of the organization of healthy natural systems. This calls us to transition from hierarchical institutions that facilitate the exploitation of people and Earth to holarchic institutions that facilitate holonic self-organization for the well-being of all. The Theory of the Community embraces life as its defining value and improving lives as its defining purpose. Two clusters of principles can guide institutional design and management: ethical principles and structural principles. The ethical principles of the institutions of an ecological civilization are well framed by an international document known as the Earth Charter. The process of drafting the Earth Charter began in 1987 with the Brundtland Commission’s call for a “new charter” to set “new norms” to guide the transition to a sustainable human future. In 1996, Maurice Strong, who served as secretary-general of the 1992 UN Earth Summit held in Rio de Janeiro, and Mikhail Gorbachev, former president of the Soviet Union, created the Earth Charter Commission, which they co-chaired with three other leaders from Asia, Africa, and South America. At their invitation, theologian, philosopher, and philanthropist Steven Rockefeller led an international drafting committee that conducted a lengthy survey of relevant principles of international law and over more than three years engaged in worldwide consultations with thousands of people of diverse races, cultures, religious traditions, and political leanings. The product was the Earth Charter, launched on June 29, 2000 at the Peace Palace in the Hague. It is a brief and inspiring declaration of fundamental, universally shared ethical principles. The Charter calls on humanity to respect the inherent worth of all members of Earth’s community of life, care for that community in all its diversity and interdependence, and recognize the inherent individual and collective dignity of all people. It reminds us that freedom, knowledge, and power carry a corresponding individual and collective responsibility to care for the common good. To fulfill that responsibility, the Charter affirms that we must secure Earth’s living bounty and beauty, while creating democratic societies that are just, participatory, sustainable, and peaceful, celebrate diversity, and enable all people to achieve a secure, meaningful, and ecologically responsible livelihood now and for all generations to come. The defining purpose of all legally sanctioned institutions is to serve life. Because life is their purpose, their performance is appropriately evaluated against metrics of healthy life function. Money and business are means—not ends. The principal units of organization are living communities of place. All legally formalized institutions, including the institutions of business and banking, are properly grounded in, dedicated to serving, and accountable to the communities in which they function. The system structure is holonic, not hierarchic. The system is composed of nested communities in which higher level organizational structures support and are ultimately accountable to self-reliant, self-organizing communities of place that maintain rule-based local markets populated by locally owned and accountable businesses. Resource flows are circular, not linear. Human systems align with Earth’s naturally recycling regenerative systems and facilitate the healing and enhancement of the latter to the benefit of all. Labor and capital are unified and equitably shared. Worker and community ownership eliminate the separation of labor from ownership. Financial and spiritual rewards are shared among those who contribute. Absentee ownership is eliminated. Speculation and financial manipulation are prohibited. The successful transition to an ecological civilization will require that we learn to meet our needs as intelligent, self-aware organisms in symbiotic partnership with the rest of Earth’s community of life. The above institutional design principles provide an initial frame for addressing the institutional challenges at hand. If humanity decides to make improving lives a defining purpose of our institutions, the elaboration, refinement, and application of the principles of a Theory of Community may occupy organization and management scholars for generations to come. Many among such scholars have long been concerned with facilitating self-organization within relatively small groups—a critical piece of learning to organize as holons rather than hierarchies. We must now learn how to do this on a macro—ultimately global—scale. It may be helpful to note that non-human organisms manage these processes with no evident equivalent of accounting tokens (money), authority structures (governments and corporations), or formal rules (laws and legal contracts). It is unlikely that humanity will abandon the use of these institutions. They likely will need dramatic redesign, however, to serve the needs of an ecological civilization for which life is the defining value and money is simply a useful tool. Humanity has reached a defining choice point. We can embrace the vision of an ecological civilization grounded in the ethical principles of the Earth Charter and prosper in the pursuit of life. Or we can hold to our present course and perish in the pursuit of money. This choice is eloquently captured by the Earth Charter’s closing words. The time has come to unite as families, communities, and nations in our common identity as members of Earth’s community of life with a shared commitment to create a world of peace, beauty, creativity, and caring for all. 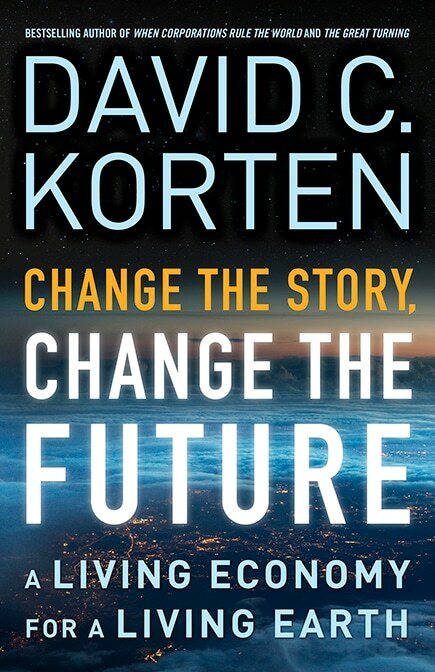 David Korten is co-founder and former board chair of YES! 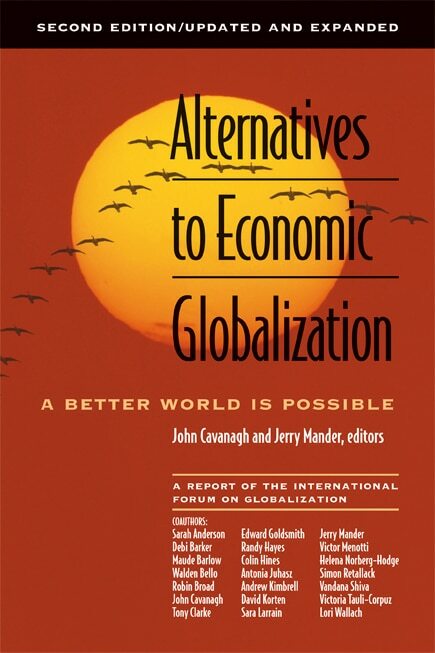 Magazine, president of the Living Economies Forum, a member of the Club of Rome, and the author of influential books, including When Corporations Rule the World; The Great Turning: From Empire to Earth Community; The Post-Corporate World: Life after Capitalism; Agenda for a New Economy: A Declaration of Independence from Wall Street; and Change the Story; Change the Future: A Living Economy for a Living Earth. He holds MBA and PhD degrees from the Stanford Graduate School of Business and is a former Harvard Business School professor. His current work builds on lessons from the 21 years he and his wife, Fran, lived and worked in Africa, Asia, and Latin America on a quest to end global poverty. 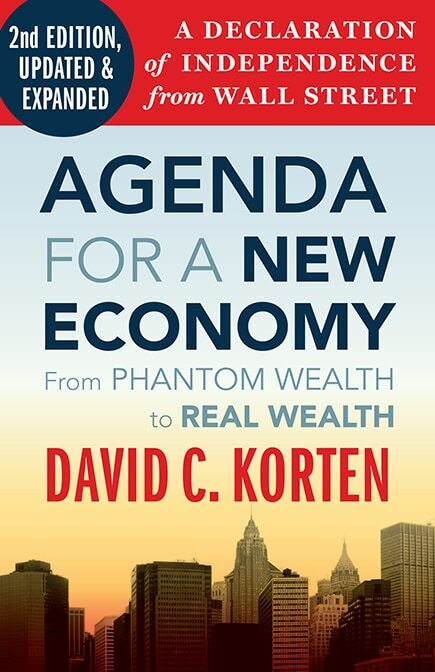 Follow him on Twitter @dkorten and Facebook. Appreciation to Michael Pirson for editorial guidance and especially for drawing my attention to the significance of the Theory of the Firm and potential importance of a Theory of Community. Thanks also to Fran Korten, Jeremy Lent, Steven Rockefeller, and Erica Steckler for their critical intellectual and editorial guidance. And to Sandra Waddock for her insights into neoliberalism and the connection between metanarratives and memes. In addition, this paper is the product of contributions from the many colleagues whose friendship and mentorship made seminal contribution to my understanding of reality and human possibility over the course of my life. These include most notably: Thomas Berry, Marcus Borg, John B. Cobb, Jr., Herman Daly, Rianne Eisler, Matthew Fox, Willis Harman, Mae Wan Ho, Joanna Macy, Donella Meadows, Robert North, Steve Piersanti, Elisabeth Sahtouris, Vandana Shiva, and Judy Wicks. Each made foundational contributions at critical points in my intellectual journey.